I am a little slow getting my post done today since I have been busy watching Wimbledon today. Ladies’ semi-finals! Mostly I am only interested in Roger Federer winning but I am willing to watch others give it their best. John and I are pretty avid tennis players although my knee injury of five years ago has really slowed me down. Tonight’s Greek vegetarian dinner was really delicious and also did not heat up the kitchen at all. Along with some hummus and pita that we bought at the grocery store we had the leftovers of tabbouleh from the other night and some really delicious Greek salsa. I made this salsa the other day to have with our salmon and it seemed like a good choice to make with our dinner on Veg Monday. The rendition tonight had the addition of feta cheese. The fresh combination of cucumber and tomatoes along with olives, feta, and pepperoncini with a lemon and olive oil dressing went really well with the hummus and pita. It is a good idea to use ingredients from the grocery store on these hot days. The base of our dinner tonight was store bought hummus and pita. The tabbouleh was leftover from Saturday and the Greek salsa was a fresh comp9onent from today. There is no shame in using grocery ingredients and leftovers to craft a new meal. 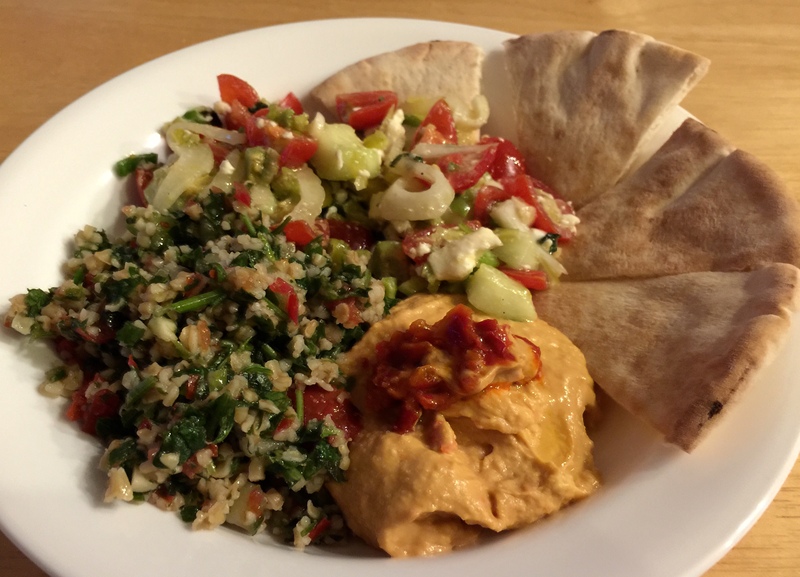 This entry was posted in Grains, Kitchen tips, leftovers, Vegan, Vegetables, Vegetarian and tagged Cherry tomatoes, cucumber, feta, Greek, hummus, Pita, tabbouleh. Bookmark the permalink.